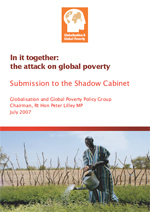 Peter Lilley launched the Globalisation and Global Poverty Group's final report this morning. It is substantial, detailed report and it makes 76 recommendations. You can download a copy of the report here. Like the Social Justice report the Global Poverty report demonstrates the depth of the policy work that the Party is undertaking. David Cameron can be very grateful to Peter Lilley and the other members of the Group for their work on this excellent report which communicates a conservative vision for fighting poverty in the developing world through more "real" trade and more effective aid. If you want to know more about the Report and have the opportunity to vote on its recommendations you can visit the Global Poverty section of Stand Up, Speak Up. and services from low income countries. "income countries on substantially all of their output. "The abolition of all export subsidies from the EU and other developing countries. "An increased emphasis on Aid for Trade (i.e. aid dedicated to helping developing countries build up their capacity to export). "Incentives (including compensation for lost tariff revenues) to low income countries to reduce trade barriers against neighbouring low income countries and particularly to kickstart development of a Pan African Trade Area." "Partnership Trusts: the UK should promote Partnership Trusts in each country, pooling the aid efforts of as many donors as possible through one simple channel. Recipient governments would be spared from dealing with multiple donors with conflicting reporting requirements. Local representatives would be non-voting trustees, advising on strategy and monitoring performance. "Predictability: DFID should, where possible, make three year rolling commitments and give indicative ten year projections for aid. "Demand-led Funding: Aid projects are currently initiated from the top down. To harness the knowledge, experience and self-interest of people in each developing country, the Report recommends establishing Demand-led Funds to allocate the aid budget. They would invite project applications from local organisations, NGOs, and private companies as well as national and local governments and finance the best, subject to robust performance measures and auditing arrangements. "Independent Evaluation Group: This would be modelled on the National Audit Office. It would evaluate DFID’s aid effort and report direct to Parliament. "Global Donor Index: to put pressure on donors to improve governance of their aid efforts, the Report proposes publishing an annual Global Donor Index designed to measure each donor country’s performance and effectiveness." The Report calls for corruption to be acknowledged and says the UK should seek greater accountability of how aid is spent. Because conditional aid is hard to enforce the Report says the focus should be on transparency and improve financial management. It also says British officials should not be afraid to highlight corruption. I've worked it out: brace yourself. David Cameron is building "One World Conservativism", much as Disraeli built "One Nation Conservatism". Let's hope it is as popular. So how is this going down in the media? Well there is the little matter of middle england focusing on flooding. If we attempt to talk about something else (RWANDA, international development) it will just be ignored. This Report's impact is being drowned out by the problems at home. The Mail's Littlejohn sticks the knife in "In the middle of a national crisis, he shouldn't go missing, giving the impression that he cares more about Africa than his own backyard. The time for stunts is over. Call Me Dave has to decide whether he wants to be Prime Minister or a rich man's Bob Geldof." It is a bad time to bring out good news. Since when has a Conservative policy been built on the EU? I wasn't that keen on HF's post the first time. Cameron will be back for tomorrow's PMQ. Journos and opponents will have their fun at Cameron's expense, but of course he should not have cancelled the Rwanda visit, including speaking at their Parliament; or delayed this report- for what: some more photo ops in his gumboots? It is the Government's responsibility to deal with the floods, not the Leader of the Opposition. But it is the latter's role to learn the lessons - and one is that you cannot ignore climate change. Fortunately he has already said that, and therefore starts off from a good position. I post this from the perspective of being far from any sort of "Cameron groupie" - I'll always vote for the party that will deliver lower taxes and less European federalism than its opponents. Fortunately that's the Tory Party too. Some shockingly good ideas here - a shame no one is paying attnetion. Shouldn't its official laucnh be delayed until the floods have (literally and metaphorically) faded away? "Since when has a Conservative policy been built on the EU?" Precisely the problem, Jonathan - so much power has been ceded to the EU rather than being under democratic control from Westminster. When David Cameron said Conservatives should not "bang on about the EU" he had seemingly forgotten that this would make it impossible to discuss the entire trade agenda, never mind all the other areas the EU now controls. Mmmm, I think these things have been tried and rejected by protective rich countries worried about local objections from farmwers etc. How many of these suggestions really could be passed through the EU or free trade negotiations. For every product there is a motion to free the trade of there is a country willing to block to protect domestic producers. We should be scrapping International Aid completely not increasing it. It creates a situation similar to "welfare dependency", it enables those countries to avoid grappling with the political, social, and economic conditions. When foreign aid becomes a significant part of a nation's income, the result is waste, corruption, rent-seeking, and indefinite postponement of needed economic and political reforms. All that interest free money flowing into a small economy increases inflation and plays havoc with currency exchange rates. It also creates an impression that the First World is paved in gold which in turn causes emmigration to our shores and drains those countries of skilled labour. Africa has received some $600 billion in foreign aid since 1960, yet Africa is poorer today than it was then. China's economic growth, which Peter Lilley mentions for some reason, was not due to hand-outs. We the undersigned petition the Prime Minister to guarantee that the British people will be permitted a binding referendum on any and all attempts to resurrect the EU "constitution" (and any or all of its content) regardless of nomenclature. What a bunch of losers! So Conservative policy is now not to actually do anything but to ask 27 governements in the EU to do something which is against the very core of the EU-the Customs Union. ize that half of Britains aid is simply given in one big cheque for Brussels to fiddle about with ,deduct bureucratic costs and then pass on in less than transpsarent ways to other governments. No wonder barely a trickle ever reaches the poor. Whats happened to that grubby socialist creep Bob Geldorf? I thought he agreed to do this one for Cameron. Whatever the subject you bring it back to Europe which is the most important issue for a large 1% of the electorate. "Whatever the subject you bring it back to Europe which is the most important issue for a large 1% of the electorate." Don't be terminally stupid. Do you suppose UKIP, which is purely a one-issue party, got 1% when they got all those MEPs a few years ago. "Carry on Cleo" is obviously a total phoney troll. "She" says she is just a floating voter who "might" vote conservative. It's a lie. Floating voters who "might" vote Tory don't spend hours crouched over conservative sites just in order to post brainless one-liners supporting the party status quo. They have better things to do. "She" is clearly committed to the party line and acting under orders. Here we go again. I am taking no orders, simply making observations as I see it. Like crouching over conservative sites in order to be brainlessly rude to potential supporters? That's interesting, Cleo - it's actually gone down in saliency with the electorate since the 2005 GE, where it was rated as a significant issue in determining voting intention by about 7% of the electorate, if memory serves. (Caveat: I'm not quite comparing like with like here, as the old poll asked about VI, whereas the new one asks about "important issues facing the country"). "Europe which is the most important issue for a large 1% of the electorate". 88% of British people would like to see a referendum on the new European constitution according to a recent ICM poll, you are obviously one of the new generation of numerically illiterate. Mark, we're getting off-topic here, but I believe Cleo has cited the 1% figure from this poll. Your "numerically illiterate" comment was therefore a bit hasty. When foreign aid becomes a significant part of a nation's income, the result is waste, corruption, rent-seeking, and indefinite postponement of needed economic and political reforms. What has Britain achieved "unilaterally" in the EU so far ? Do they know that tariffs are cross-linked with the USA by treaty on MFN status and the Americans do not want Brazilian oranges, soya or peanuts, or foreign cotton undermining Congressional districts ? "Mark, we're getting off-topic here, but I believe Cleo has cited the 1% figure from this poll." Like I said "Carry on Cleo" is an obvious troll. Numerically illiterate? Need you ask? So what if only 1% currently support UKIP? The vast majority of Conservatives are very concerned about the EU and you can also add the BNP and the other far right parties. Cleo. Now that Cameron is on the way out the Conservative Party is going to be no place for people like you. I'm sure the Lib Dims will make you very welcome. "Unilateral tariff and quota-free access to the EU (and all other developed economies) for all goods and services from low income countries. " And how does CaMoron suggest we do that? Can he pursuade the French to drop the CAP? The Boy alone be the man to reform Europe from a protectionist club to a real free trade zone? Fantasy. You might as well say "in europe not run by europe." for all the good it does. Still, I'm not bothered by this Cameron is finished. He just doesn't know it yet.